The President of India, Shri Pranab Mukherjee has extended his greetings and felicitations to the Government and people of the Arab Republic of Egypt on the eve of their National Day (July 23, 2015). 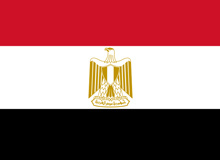 In his message to His Excellency Abdel Fattah el-Sisi, the President of the Arab Republic of Egypt, the President has said, “On behalf of the Government, the people of India and on my own behalf, it gives me great pleasure to extend warm greetings and felicitations to you and to the people of Egypt on the occasion of your National Day. India and Egypt have traditionally enjoyed warm and friendly relations. I take this opportunity to emphasize the importance that India attaches to its relations with Egypt. I remain confident that Egypt will continue to move ahead on the path of political stability and economic revival under your able leadership and that the bonds of friendship and cooperation between India and Egypt will continue to strengthen and diversify in the years to come. Shri Avinash Rai Khanna, MP, Rajya Sabha and Shri Vijay Kumar Chopra, Editor-in-Chief, Punjab Kesari Group called on the Prime Minister, Shri Narendra Modi today and presented drafts worth over Rs 2.40 crore towards Prime Minister's National Relief Fund (PMNRF), on behalf of the Punjab Kesari Group. The Government in July 2014 had announced tripling of the then existing capacity of 4780 MW in the next ten years (viz. by the year 2024). Setting up of more nuclear power plants based on both indigenous technologies and with foreign technical cooperation are part of this programme. Atomic Minerals Directorate for Exploration & Research (AMD), a constituent Unit under Department of Atomic Energy (DAE) has carried out survey and exploration of Uranium resulting in establishing 2,25,936t in-situ U3O8 (1,91,594t U) reserves as of June, 2015. 21 nuclear power reactors are under operation in the country with an installed generating capacity of 5780 MWe. Thirteen (13) reactors with a total installed capacity of 3380 MW (excepting one reactor of 100 MW capacity located at Rawatbhata, Rajasthan which is under extended shutdown for techno-economic assessment) are under International Atomic Energy Agency (IAEA) safeguards and are eligible for imported fuel. To meet requirement of fuel for reactors under IAEA safeguards, agreements for import of uranium are signed with M/s Navoi Mining & Metallurgical Combinat State Company (NMMC), Uzbekistan; M/s JSC TVEL Corporation, Russia; M/s NAC Kazatomprom, Kazakhstan, and M/s CAMECO, Canada. Eight (8) reactors with a total installed capacity of 2400 MW are fuelled by indigenous fuel. The Government have made efforts to augment indigenous uranium supply by opening of new mines and processing facilities thus narrowing down the demand-supply gap for reactors using indigenous fuel. As a result, there has been a progressive improvement in capacity utilisation of nuclear power plants. Contracts have recently been entered into for import of Uranium with M/s. CAMECO, Canada for supply of 2750–3000 MT of Uranium Ore Concentrate during 2015–2020; and M/s. Kazatomprom, Kazakhstan for supply of 5000 MT of Uranium Ore Concentrate during 2015–2019. This information was given by the Union Minister of State (Independent Charge) Development of North-Eastern Region (DoNER), MoS PMO, Personnel, Public Grievances & Pensions, Atomic Energy and Space, Dr Jitendra Singh in reply to unstarred question in Lok Sabha today. There are thirty one countries including India in the world which generate electricity from nuclear source. According to the data published in May 2015, by Power Reactor Information System (PRIS) of International Atomic Energy Agency (IAEA), India ranked at 12th position in terms of power generation. However, it stood at 6th position in terms of number of reactors in operation country- wise, globally. The current installed nuclear power capacity is 5780 MW, which is expected to increase to 10080 MW on progressive completion of projects under commissioning/ construction by 2019. The Government has accorded financial sanction and administrative approval for Gorakhpur Haryana Anu Vidyut Pariyojana (GHAVP) Units – 1&2 (2X700 MW) and Kudankulam Units- 3&4 (2X1000 MW) with a total capacity of 3400 MW. These projects are being prepared for launch in the current year. In addition, one Prototype Fast Breeder Reactor of 500 MW capacity at Kalpakkam, Tamil Nadu is at advanced stage of commissioning. Construction of two more Fast Breeder Reactors (FBR 1&2) of 600 MW capacity each at Kalpakkam, Tamil Nadu is also planned. More nuclear power projects based both on indigenous technologies and with international cooperation are planned in future. India has signed Nuclear agreements with USA, France, Russia, Namibia, Mongolia, Republic of Korea, Argentine Republic, United Kingdom, Republic of Kazakhstan, Canada, Sri Lanka and Australia. India is open to negotiation with other friendly countries who seem to have potential to make contribution to India’s nuclear energy programme. The nuclear power capacity is expected to reach 10080 MW on progressive completion of projects presently under commissioning/construction by the year 2018-19. The Government has accorded financial sanction for two more projects namely Gorakhpur Haryana Anu Vidyut Pariyojana (GHAVP) Units 1&2 (2x700 MW) and Kudankulam Nuclear Power Projects (KKNPP) Units – 3&4 (2X1000 MW) with a total capacity of 3400 MW. These are being readied for start of construction in the current year. Another 2X700 MW project is also planned to be taken up in the near future. On progressive completion of these projects, the target is expected to be achieved by the year 2024. The Government, in July 2014, had announced tripling of the then existing capacity of 4780 MW in the next ten years, that is by the year 2024. A capacity of 1000 MW has already been added with the start of commercial operation of Kudankulam Nuclear Power Project Unit-1 (KKNPP 1) in December, 2014. M/s General Insurance Corporation of India (GIC-Re) have on 12th June, 2015 launched Indian Nuclear Insurance Pool (INIP) with the capacity of Rs1500 crore to provide insurance to cover the liability as prescribed under Civil Liability for Nuclear Damage Act 2010. The Government, through Antrix Corporation Limited (Antrix), the commercial arm of Department of Space, is generating income through launching of satellites of foreign countries on-board ISRO’s launch vehicle. Till date, 45 satellites from 19 countries have been successfully launched using ISRO’s Polar Satellite Launch Vehicle (PSLV), under commercial arrangement. The total income earned through launching of these satellites of foreign countries amounts to approximately 17 Million USD and 78.5 Million Euros. The launch missions conducted by ISRO for launching Indian satellites are intended for National development. The Antrix has signed agreements for launching 28 more foreign satellites from 6 countries viz., Algeria (3), Canada (4), Germany (4), Indonesia (2), Singapore (6) and USA (9). The launches of these foreign satellites are envisaged during 2015-2017 time period. Further, discussions with foreign agencies/companies are ongoing for providing launch services to their satellites on-board ISRO’s Polar Satellite Launch Vehicle (PSLV) and Geo-synchronous Satellite Launch Vehicle (GSLV). The images received from the Indian Remote Sensing (IRS) satellites (RESOURCESAT-2, RISAT-1 and CARTOSAT-1) are marketed globally by Antrix Corporation Limited (Antrix), the commercial arm of Department of Space, through International Ground Stations established outside India. The IRS images of region outside India received and processed at ISRO’s Ground Station are also marketed to global customers through Antrix. The Government is planning to provide space based systems for South Asian Association for Regional Cooperation countries. The objective of this satellite project is to develop a satellite for SAARC region that enables a full range of applications and services to all our neighbours in the areas of telecommunication and broadcasting applications viz. Television, Direct-to-Home (DTH), Very Small Aperture Terminals (VSATs), Tele-education, Telemedicine and Disaster Management. While the cost towards building and launching the satellite will be met by Government of India, cost towards ground systems are expected to be sourced by the respective SAARC countries. This information was given by the Union Minister of State (Independent Charge) Development of North-Eastern Region (DoNER), MoS PMO, Personnel, Public Grievances & Pensions, Atomic Energy and Space, Dr Jitendra Singh in reply to question in Lok Sabha today. Indian Space Research Organisation (ISRO) has initiated a process of formulating a National Space Act for India for regulating space activities in India; facilitate enhanced levels of private sector participation and offering more commercial opportunities. Towards this, a two day national workshop was held at ISRO Headquarters, Bangalore during Jan 16-17, 2015 with the participation of experts across the country. The draft version of the National Space Act has been prepared and consulted with Space Law experts and internal experts within the Department of Space. Department of Space has initiated the process of charting out a roadmap for the Country’s space programme addressing the short-term and long-term needs in the areas of Space Transportation Systems, Satellite Communication & Navigation, Earth Observation, Space Sciences & Planetary Exploration and Space-based applications for governance and development. Towards evolving an action plan for completing all the approved projects, the Department has initiated a series of reviews focussing on progress achieved, identify the tasks to be completed and fix the targets for realising the missions in a timely manner. Indigenous GSLV will launch 2 ton class of communication satellites in space. ISRO has been utilizing the Indian industry for the manufacturing and production of the various components and sub-assemblies required for the development of space technology since 1976. In order to ensure the smooth supply chain of hardware, components and sub-systems, ISRO is planning to magnify the role of industry partners by increasing the scope of work from sub-system/hardware level to system level in a phased manner. The entire gamut of activities that goes into the realization of the launch vehicles or satellites could be performed by the industry, except mission critical activities and launch operations.